The Bampton Beam contains local community information, recipes, puzzles and interesting articles. 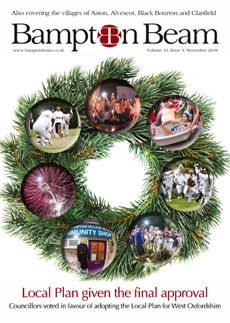 It is published quarterly and the distribution area covers Bampton, Weald, Clanfield, Aston, Alvescot, Lew, Radcot and Chimney with copies also being available for pick up in the surrounding villages. Our total distribution is currently 4000 copies each issue. Our website directory allows people to easily search for a local business when they need one. As well as providing an online resource for local residents the website has plenty of handy information for those living outside the area, visiting the village on holiday, or thinking of moving to Bampton. The Bampton Beam is independently owned and prides itself on being a true community magazine that encourages people to use the businesses and services available in the area. Our advertising options and rates are displayed to the right for both the magazine and website. If you would like more details on acceptable advert formats, copy deadlines and advert design services then please request a copy of our media pack. If you would like to advertise your business either in the magazine or on the website please complete the Register Business Form, via the below link. We will then contact you to confirm your booking. Please note that, due to its popularity, at times there may be a waiting list for advertising space within the magazine. All magazine advertisers receive a free web listing. Website Advertising A website listing gives you your own profile page displaying your contact details and a detailed description of your business plus the chance to have one offer live on the 'Local Offers' page. All this for only £5.00 per month.